For working in ANNs user should know algebra and the handling of functions and vectors. Differential calculus is recommendable but not necessary. One efficient way of solving complex problems is following the lemma “divide and conquer”. A complex system may be decomposed into simpler elements, in order to be able to understand it. Also simple elements may be gathered to produce a complex system . Networks are one approach for achieving this. There are a large number of different types of networks, but they all are characterized by the following components: a set of nodes, and connections between nodes. The nodes can be seen as computational units. They receive inputs, and process them to obtain an output. The connections determine the information flow between nodes. They can be unidirectional, when the information flows only in one sense, and bidirectional, when the information flows in either sense. One type of network sees the nodes as ‘artificial neurons’. These are called artificial neural networks (ANNs). An artificial neuron is a computational model inspired in the natural neurons. Natural neuronsreceive signals through synapses located on the dendrites or membrane of the neuron. When the signals received are strong enough (surpass a certain threshold), the neuron is activated and emits a signal though the axon. This signal might be sent to another synapse, and might activate other neurons. The higher a weight of an artificial neuron is, the stronger the input which is multiplied by it will be. Weights can also be negative, so we can say that the signal is inhibited by the negative weight. The number of types of ANNs and their uses is very high. Since the first neural model have been developed hundreds of different models considered as ANNs. The differences in them might be the functions, the accepted values, the topology, the learning algorithms, etc. The function of ANNs is to process information, they are used mainly in fields related with it. There are a wide variety of ANNs that are used to model real neural networks, and study behaviour and control in animals and machines, but also there are ANNs which are used for engineering purposes, such as pattern recognition, forecasting, and data compression. There are weights assigned with each arrow, which represent information flow. These weights are multiplied by the values which go through each arrow, to give more or less strength to the signal which they transmit. The neurons of this network just sum their inputs. 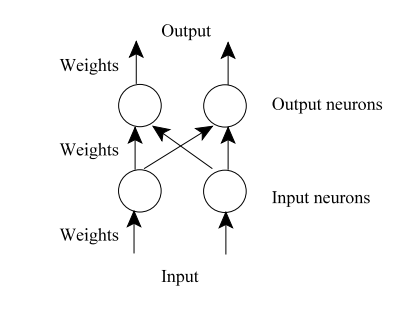 Since the input neurons have only one input, their output will be the input they received multiplied by a weight. What are the Control Statements in Python? How to Add Subtitles to a Movie on VLC?